Researchers of the University of Valencia have dated between 14.500 and 13.500 years ago the remains of balanus, a crustacean that lives over the skin of the whales, found in a bonfire of the Cueva de Nerja (Málaga). 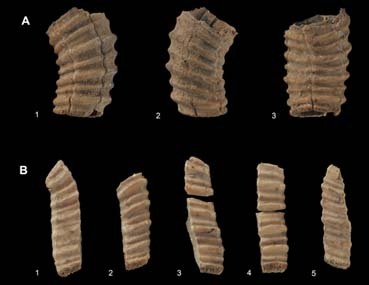 This singular data makes this finding the first scientific evidence of human consumption of whale meat during Prehistory in Europe. The scientists of the University, coordinated by professor Joan Emili Aura Tortosa, have analyzed some artifacts of stone, horn and bone found in the bonfire, as remains of coal. The study of these remains has been carried out by a research group dedicated to archaeology of prehistoric hunter-gatherers of the Mediterranean zone, during the last 18 months, and has been accepted for its publication in the journal Quaternary International. The group of the University of Valencia is coordinated by Joan Emili Aura Tortosa, Professor of Prehistory and Archaeology, and composed by Manuel Pérez Ripoll, Ernestina Badal, Yolanda Carrión, and Juan V. Morales Pérez. Their works have focused on the analysis of the evolution of palaeoenvironmental and socioeconomic changes from archaeological artifacts and paleontological and paleobotanical remains. The Universities which also have participated in the discovery and dating of the remains are: University of Salamanca, Spanish Distance University (UNED), the Complutense University of Madrid and Australian National University, as well as the Geological and Mining Institute of Spain and the Natural History Museum of Paris and of Natural Sciences of Madrid.The works have been funded by the Ministry of Economy and Competitiveness of the Spanish Government. This large interdisciplinary team is studying since many years ago the materials obtained in the systematic archaeological excavations carried out between 1979 and 1986 in the hall of the Mina de la Cueva of Nerja under the direction of Professor Francisco Jordá Cerdà (1914.2004). The remains of balanus of whale (Tubicinella largest and Cetopirus complanatus) were found in the occupations dated at the end of the maximum glacial (between 14.500 and 13.500 years) and associated with the late technological tradition of the Upper Paleolithic: the Magdalenian. The association of balanus in the rests of food and hunting and fishing equipment made of bone and stone is the oldest indirect evidence of the consumption of whales in European Prehistory. The balanus are a genus of crustaceans that live over the skin of the whales. Their presence in the archaeological deposits of the cave only could be the result of human contribution, taking into account that the coastline at that time was located at 4 km of distance of this camp of prehistoric hunters and fishermen. Today, the cave is located 1 km away from the sea shore. It’s the first time that these two species of balanus of whale are found together in an archaeological prehistoric site in a global geographic context. The two species identified by Esteban Álvarez and René-Pierre Carriol (Tubicinella largest and Cetopirus complanatus) are associated with a specie of whale of the Southern Hemisphere (Eubalena australis), although there are also quotes of their association with the frank whale distributed currently in the North Atlantic (Eubalaena glacialis). These data have an important palaeoecological interest because in both cases confirm a significant decrease in the temperature of marine waters, known from soundings conducted at the Alboran Sea, contemplating, thus, various alternatives about the distribution of these whales in the past. The cetaceans should have been stranded in the low beaches so there they get the pieces of meat, grease and skin which were brought into the cave for consumption or for the use of its grease and skin. This use differs from the documented one of other smaller sea mammals, also identified in Nerja, therefore have not been identified any other whale bone, which contrasts with what happened with dolphins and seals, represented by various skeletal parts (jaws, teeth, vertebrae, ribs, etc).